Tick Tock Tick Tock! I'm actually now at the final stage. Its my 36 weeks! It is not a surprise if I would have give birth tomorrow haha! So many new things to learn and sooo many things to prepare. 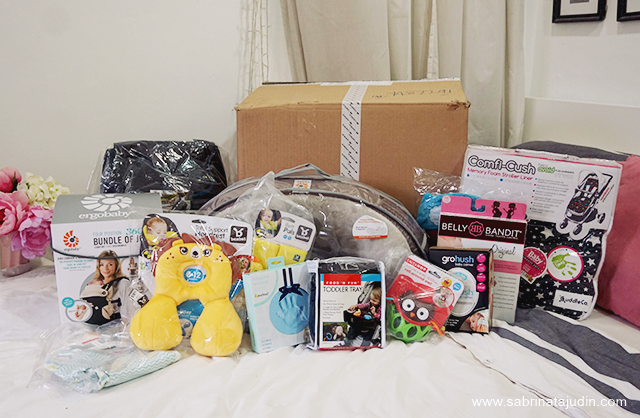 So I got more haul for my baby, in shaa Allah. I got hook up with some Bloom & Grow products and I am sooo excited to use them I know it takes some stages and time for some of these as it need some suitable time to use them. 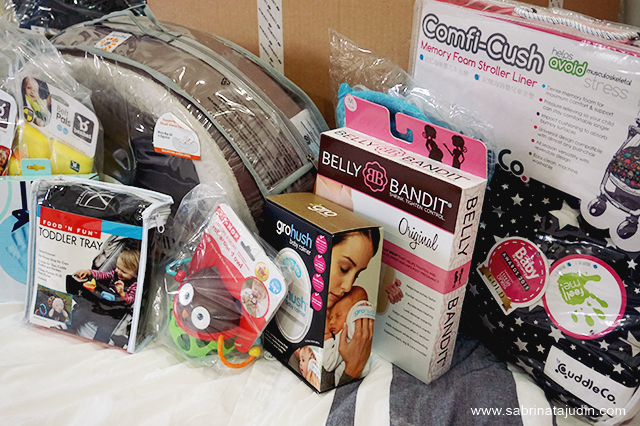 So I got some essential and so cool stuff for my little man, hopefully! So Bloom & Grow (B&G) is a distributor for all kinds of baby/children products brand. You might have seen them in some shops/retailers and online stores. 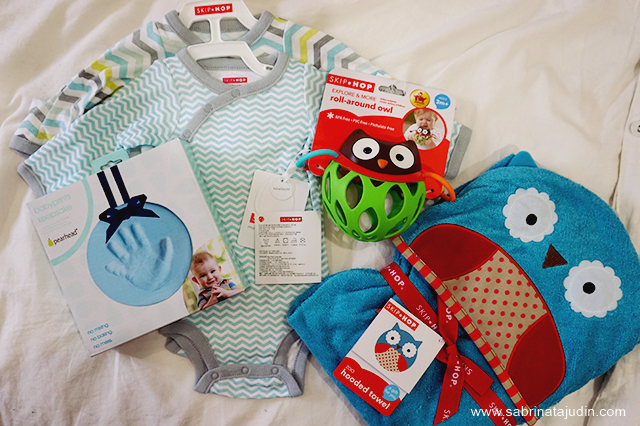 There are tons of products they offer, from care to safety, toys, accessories, clothes, food utensils and many many more. So wanna see what I got? Come check out below! I got a few stuff here. Some clothes, toys, baby carrier and some for my self too. Do follow my Instagram because from time to time I will give you my thoughts on these products on how they works, how it helped me taking care of Baby A and of course review on them. So first off, I got some stuff from Skip Hop. I got some newborn clothes, this starry chevron side-snap long sleeve body suit set. Love the quick snap side buttons to make my job easier later haha. It is 100% made out of cotton and it is so soft! Baby A going to sleep so comfortable in these. Then I got a hooded towel (Skip Hop Zoo Hooded Towel), It is a soft, fast absorbent 100% cotton material made perfectly for any sizes of ages. It's going to be a fun bath time! Lastly from the picture above I got this babyprints color ornament from Pearhead. Got in blue and will use this when Baby A is big enough haha. It is a non-toxic, soft air drying clay. No baking required. Just a little touch of fun to mark Baby A journey as a baby. I know he is going to grow up so fast and I am going to miss his little chubby hand later. hehe. I saw a lot of parents these days a re using this so I got one for my self. 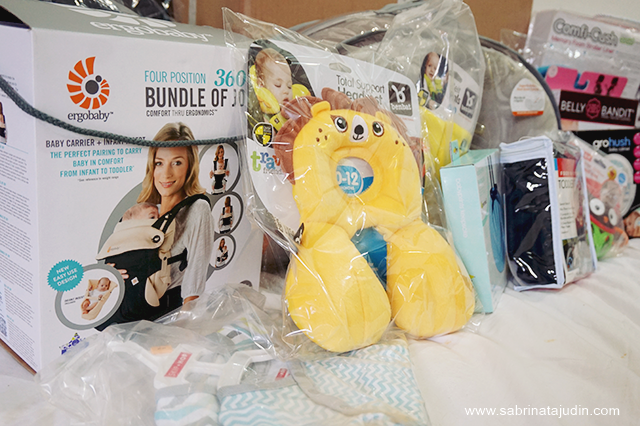 This is the Egrobaby Four Position 360 Bundle OF Joy Baby Carrier. It can be use in so many ways and it also comes with a newborn Infant insert. So I find this is pretty cool! Got it in black so hubby can use this and still look masculine. hahahaha! So mama also got to make herself comfortable. 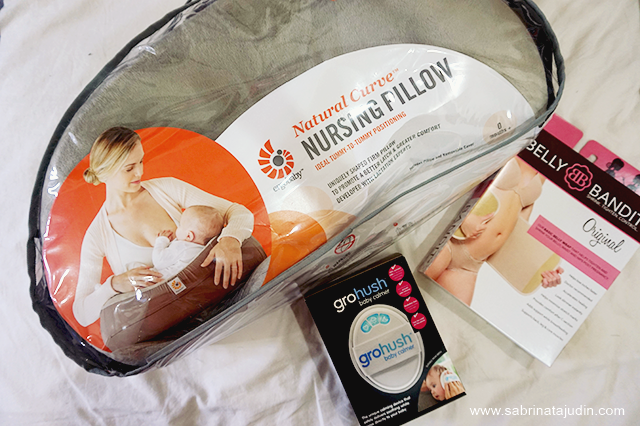 I got myself the Egrobaby Natural Curve Nursing Pillow for breastfeeding comfort or I think can also be use during bottle feed time. It provides nursing support and comfort while breastfeeding. Then I got the Belly Bandit to help mummy looking slimmer after giving birth, ya all know mommy needs some looking good essential too right. Then I got to try this cool device call grohush This device is a unique tool that use to calm babies. It transmits soothing "white noise" directly to your baby that will help to calm and soothe the baby without disturbing others around. It has 3 different noise sound to choose from, heart beat, ocean waves and rain falling. The device is operated with batteries and it has a soft cover on the bottom part to make it more comfortable on the baby while using it. You can watch a video on how this works here! Then some accessories for the car seat and stroller. That cute lion head rest and seat belt accessories are from Benbat. 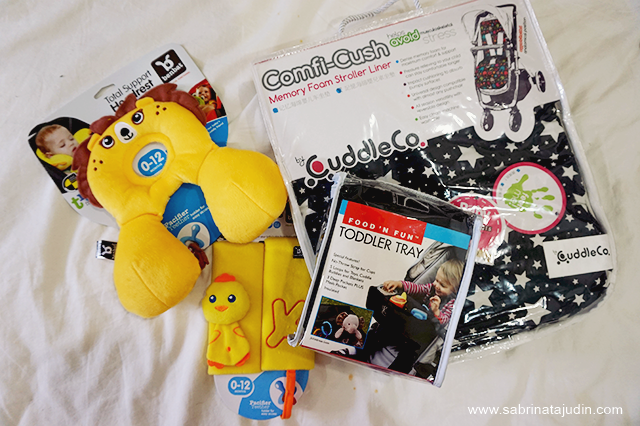 Some accessories for the stroller, I got the CuddleCo Momory Foam Stroller Liner, just to give some extra comfort for baby A and the toddle tray from Food N Fun for the front part. Last and not least of course, a diaper bag! A bag that is pretty much the savior of all as a parent. Will need to carry lots of stuff after this and instead of going for a normal tote, I choose a backpack so me and hubby can switch roles carrying this. First impression of this cool Skip Hop bag is, amazing! I love the design and material. Will definitely give my thoughts on this more when I have use it! So if you are interested to know more and what more do they have, check out these links below! Follow them as you will get useful parenting tips along the way too! More to come, and see you in my next post! wahhh...hooded towel tu comel..ngeee..kita da follow..
As Salam Sab, tahniah. Bahagianya menjadi seorang Ibu kan. Syukur. 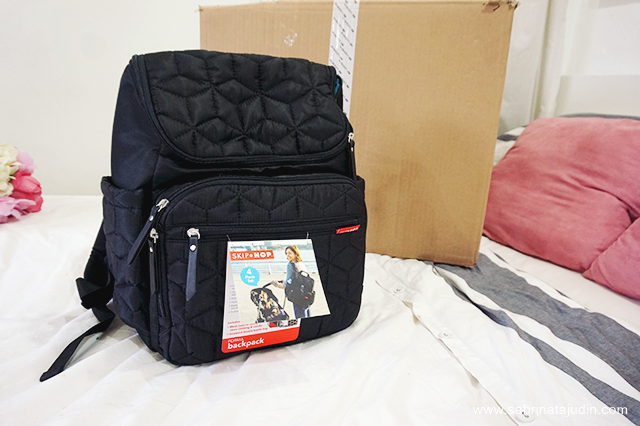 Semoga dipermudahkan semua urusan :) Btw, diapers bag tu memang wishlist until my baby dan 7 bulan pun belum tertunai haha. Best nye!!! !